A minutes silence was observed at the start of this game for the late Tom Fitzgerald, former Secretary of the North Kerry Football Board and also for Martin Costello, Asdee. Chairman of the Board Billy Enright paid a fitting tribute to the late Tom prior to this. Last years defeated finalists Ballydonoghue went one better on this occasion when they proved a bridge too far for Asdee played in perfect conditions at Stack Park, Ballybunion on Sunday last in a game that saw 3 players red carded in the opening 5mts of the second half. It was intensity in defence and attack that allowed Ballydonoghue to comfortably overcome an Asdee side who in fairness didn’t do themselves justice on the day and only for a short spell in the second half when they reduced the half time deficit of 1-9 to 0-2 down to a 4pt margin at the three quarter stage did they look any where in contention. On the other hand Ballydonoghue were fully deserving winners; certainly the better team on the day, played the better football and had a spread of scores from 7 different scorers that saw Colin O Mahony marshalling a tight knitted defence, ably assisted by Stephen Lonergan and jack Gogarty, Martin O Mahony giving a man of the match performance at midfield and once again the twin threat of Paul Kennelly and Eamon Walsh caused endless problems for the Asdee rearguard. The game got underway with Asdee gaining possession from the throw-in that say Padraig Ruddle finish a 5 man move for a splendid point inside the opening minute. However despite been dominant for the first 5 mts they were not putting scores on the board and once Ballydonoghue settled it was practically all one way traffic for the remainder of the half and any time Asdee went on the attack they were forced back by a fired up Ballydonoghue defence. I suppose the foundation of victory was formed at midfield and as already stated both Martin O Mahony and Dan O Connor easily outplayed their opponents and this led to a good supply of ball into attack that say Paul Kennelly, Eamon Walsh and Damien O Carroll kick superb points with Asdees only reply coming with 3mts left in the first half from Eoin Kennedy. Half time score; Ballydonoghue 1-9 Asdee 0-2. On resumption Paul Kennelly put his side further ahead after 2mts. However in a game that was always played in the best of spirits there was a flare-up amongst a number of players that resulted in the dismissal of 3 players; Noel Long, Asdee and Tommy Kennelly, Ballydonoghue in the 5thmt followed a minute later by another red card offence for Asdees full back, Martin Collins. When play resumed it was Asdee who took advantage and Sean Keane and Eoin Kennedy found the net and after reducing the deficit it was maybe expected that Asdee might drive on but once Jack Gogarty soloed 50 meters from the Asdee goals and billowed the net this put a sudden halt to Asdees dreams of the Division 2 Title. Ballydonoghue used up their bench and Kieran Lynch, 2pts and Brian O Seanachain of the younger bridgade were very impressive. Overall there was no doubting as to who were the better team while Asdee will ponder on this result and when they will reflect back they will rue some sloppy play and can have no excuses on this occasion. Michael Tydings, Darren Russell, Eoin Kennedy, Sean Keane and Noel Long was their better players on the day. After the game Board Chairman, Billy Enright was on hand to present Ballydonoghue captain, John O Mahony with the Division 2 Cup amid great Ballydonoghue celebrations. Teams and scorers; Ballydonoghue; Darragh O Shea, Stephen Lonergan, John O Mahony, capt, Billy Foley, Diarmuid Behan, Colin O Mahony, Jack Gogarty, 1-1, Martin O Mahony, Dan O Connor, Paul Kennelly, 6pts, (2f), Tommy Kennelly, 1pt, Eamon Walsh, 1-2, David O Connor, Jim Cremin, 1pt, Damien O Carroll, 2pts. Subs, Eddie Sheehy for Eamon Walsh, Shane Thornton for Damien O Carroll, Brian O Seanachain for John O Mahony, Daniel Riordan for Jim Cremin, Kieran Lynch, 2pts for Dan O Connor, Gearoid Kissane for David O Connor. 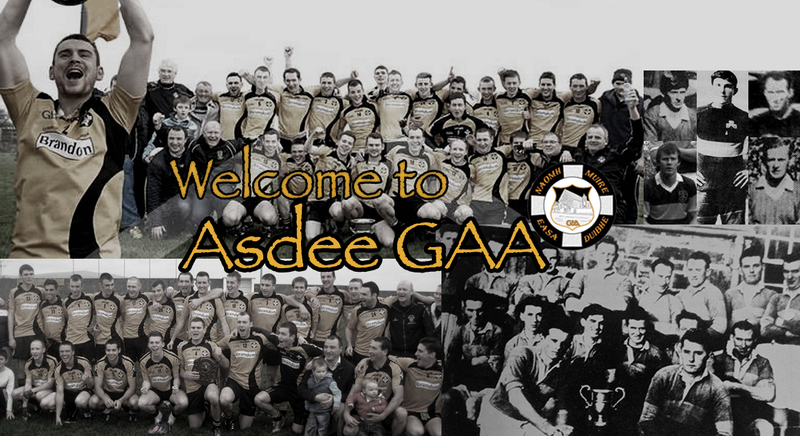 Asdee, Conor Coughlan, Con Carmody, Martin Collins, Micheal Tydings, Noel Long, capt, Sean Keane, 1gl, Kieran Kelly, John Doran, 1pt, Padraig Ruddle, 1pt, Darragh Keane, Darren Russell, 2pts, (1f), Michael Walsh, Mike Breen, Eoin Kennedy, 1-2, Charles Dalton. Subs, Thomas Mulvihill for Kieran Kelly, Paul O Carroll, 1pt for Charles Dalton, Eoin Tydings for Michael Walsh, inj, Kieran Kelly for Padraig Ruddle. NORTH FINAL. MARATHON. Asdee GAA in conjunction with Kerry Respite Care are holding a 5K,10K and Half Marathon run on Saturday 13th of September start and finishing at Asdee GAA pitch. Next round of the Credit Union County League Division 5 Asdee senior footballers will be away at J. P. O Sullivan Park, Killorglin against Laune Rangers “B” on Saturday, July 26th, 7pm. SHANNON RANGERS. Well done to the Shannon Rangers Minor Footballers who defeated St. Brendans on a score of 2-19 to 0-7 in theCounty Championship played at Ballylongford on Friday evening last. Locals on the team were Darragh Keane, Eoin Tydings and Sean Keane. They have now reached the last eight of the competition.